International SMS Service by Voodoo SMS | Bulk SMS Ltd | Send Messages Abroad. With the rise of the internet and innovative developments in technologies and logistics, international marketing and specifically international SMS has never been in more demand and has also never been more relevant. With 6.8 billion mobile phones owned worldwide, don't miss out on international SMS communication to potential customers, clients or colleagues. 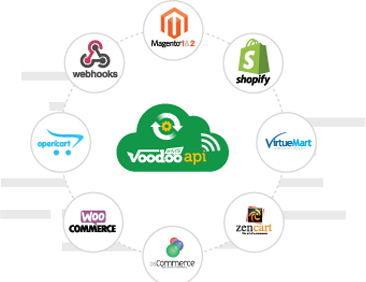 The Voodoo SMS portal allows you to send quick and efficient SMS broadcasts to market to hundreds of countries and billions of potential customers through our easy to use web-accessed portal. If you haven't already, you can sign up for a Voodoo SMS customer account here. It is completely free of charge to open an account with no contracts, tie-ins or minimum spend. When you have decided which countries that you want to send to, we can inform you of the multiplier rate as some states may be more or less expensive than the UK. We use a standard multiplier of the UK rate at that present time. Once this is done, we can enable the chosen international routes in your account. From here, simply upload your international contact list ensuring that you assign the correct country to the list. Set your alphanumeric sender ID to brand your SMS, compose your message and simply hit send! International SMS has never been so easy as with the Voodoo SMS portal. If you have an international website, CRM or order management software you can send international SMS via our powerful API. We already integrate with several e-commerce platforms which can be found here. As a team of developers, we can integrate quickly and efficiently with bespoke platforms. For more information, visit our developer API page here or contact us on +44 (0)1484 599 311. Here at Voodoo SMS, we want to make things as easy as possible for our customers to market to their customers. That's why we have provided international online opt-out links for every country in the world. 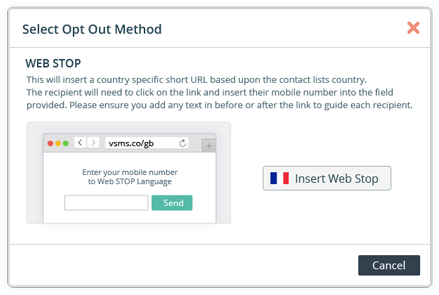 Include the opt-out option for whichever state you are sending to, and the link will take your recipient to an opt-out page in their own language. Once they have entered their number in the form, it will be automatically blacklisted in your account, meaning that you will not be able to contact them again, even if they end up on a future list. If you would like any further information on international SMS, or would like to discuss two-way international SMS please contact your account manager, or alternatively give us a call on +44 (0)1484 599 311. You can also contact us via email using info@voodooSMS.com.